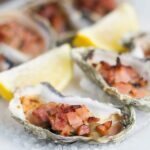 Today, I am sharing with you one of my favourite seafood recipes – Oysters Kilpatrick made with a healthy Worcestershire Sauce. Demand for seafood is at an all time high and as a result, overfishing and damaging fishing practices are depleting seafood stocks. There is also impacting the already fragile marine ecosystem, as often other marine species are harmed in these fishing practices. There is a great website that lists what species of seafood are sustainable and has lots of great tips. It is called GoodFishBadFish and I highly recommend you check it out. Oysters are a very sustainable seafood as they are farmed, which has very little impact on surrounding ecosystems. In Australia there are three common types of oysters – Sydney Rock Oyster, Pacific Oyster and Native Oysters. So it is great to know that oysters are one species of seafood that you can enjoy and know that it is not damaging the marine ecosystem. I can make them Paleo-friendly with my Worcestershire sauce recipe. Place rock salt in a thick layer on a baking tray. Place the oysters face-up on the baking tray and top each oyster with the Worcestershire sauce and bacon. Place in the grill and cook for 5-8 minutes, or until the bacon has started to brown on top and is crispy.